The Aberdeen Law Project's dedicated events team, with the help of Malcolm Combe, hosted attendees and speakers for this year's Conference on 'Pushing the Boundaries' of pro bono activity. The Scottish University Law Clinic Network Conference 2015 kicked off at 11:00am with an emphasis on how we can push boundaries and a Skype call to South Africa. Steven Budlender and Gilbert Marcus discussed their research , 'A Strategic Evaluation of Public Litigation in South Africa', with attendees before taking questions. This was followed by introductory sessions broadening the discussion on addressing boundaries and limits. Lindsey Reynolds, Senior Solicitor at the Equality and Human Rights Commission, provided an overview of the EHRC's role and legal powers leading on to how the organisation assesses which cases to take forward as raising strategic legal issues. We also heard form Julie Price, Head of the Pro Bono Unit at Cardiff Law School. She introduced the clinical activities at Cardiff, with a particular focus on their Cardiff Innocence Project - which was the first student pro bono clinic to overturn a murder conviction - and ongoing hurdles the Pro Bono Unit is facing. From L: Malcolm Combe (Faculty Director), Georgia Fotheringham (Deputy Student Director), Julie Price (Guest Speaker) and Lindsay McCormick (Student Director). Donald Nicolson OBE, from The University of Strathclyde, providing a forum for the exchange of ideas and experience in setting up and running law clinics. 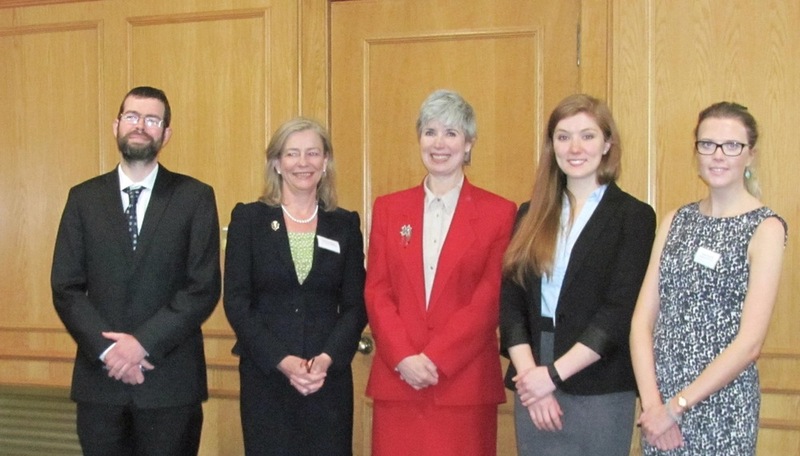 From L: Malcolm Combe (Faculty Director), Christine McLintock (President of the Law Society of Scotland), Anne-Michelle Slater (Head of the School of Law at Aberdeen University), Georgia Fotheringham (Deputy Student Director) and Lindsay McCormick (Student Director). Rob Marrs, of the Law Society of Scotland, leading a “how to” session about public legal education (commonly known as 'Street Law'). Rob Marrs (Guest Speaker) in action during his Parallel Session on 'Street Law'. At 4:00pm, the attendees gathered together to sit in on our Plenary Session, chaired by Jacqueline Kinghan, University of Edinburgh. We heard from speakers on the topic of 'integrating impact work into law clinic: Donald Nicolson brought insight from a recent paper on "retail" versus "wholesale" legal services and Rachel Knowles, Centre for Access to Justice solicitor at UCL (via Skype) discussed her experience of consultation responses, Freedom Of Information requests and strategic litigation. Further food for thought was provided by the branches of the Scottish profession, with contributions from Ross Anderson, advocate at Ampersand Stables, on behalf of the Free Legal Services Unit of the Scottish Bar, and finally Christine McLintock, President of the Law Society of Scotland. These two guests both offered insight from their own legal experience on the day's activities and also answered a few questions from attendees. Donald Nicolson (Guest Speaker) discussing "retail" vs "wholesale" legal services in the Plenary Session. Finally at 5:15pm, Lindsay McCormick, ALP's Student Director and Malcolm Combe rounded off the day's proceedings. Thank you to all of the attendees and speakers for making your way up to Aberdeen. We hope you found the day as interesting and thought-provoking as we have! If you missed out have a look at this Storify put together by Malcolm Combe.